We promise to always make you feel special, look beautiful and enjoy your whole experience with us. Heavenly Bodies Bridal was established to give an unrivalled and affordable service to brides size 14 plus. One-to-one private consultations ensure that you are relaxed, unrushed and able to experience a vast selection of stunning wedding dresses in numerous colours, styles and designs. 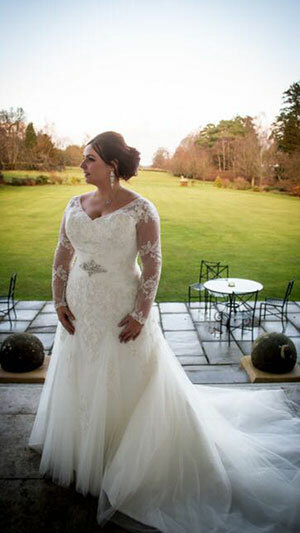 This has helped us become a leading plus size wedding dress shop in Catford London. We provide wedding gowns for the fuller figure. Unlike other bridal shops, we have invested in only plus size wedding dresses to enable you to try on as many of the various styles and designs as you wish. We have a beautiful collection of plus size wedding dresses to choose from without restriction. Visiting Heavenly Bodies Bridal is ultimately about finding your perfect wedding dress. Our expertise and enthusiasm will ensure that you achieve this goal. You will be greeted by our friendly and professional staff and receive complimentary refreshments. Our aim is to make your visit a unique and unforgettable experience. I just wanted to share a couple of photos of our big day. Thanks to you, I felt like a princess and everyone commented on how beautiful the dress was. Thanks again. I’m finally getting my feet back on to the ground nearly a year after my amazing wedding! As a larger lady I dreaded the wedding dress shopping experience, and therefore did my internet research. I very much knew my style and had spotted a few dresses I liked early on, but then as new year celebrations for 2015 started, 9 months prior to my wedding, there was my dress on your site, and in my size, and in your sale, at a bargain price, you agreed to keep it back for me whilst I arranged a day of work, and drove all the way from Birmingham to try it. Once I arrived you made me feel so at ease, and had so many other dresses for me as a size 26 to try on, which felt amazing, but also helped me realise that the dress I drove all the way up there for, really was the dress for me! You said it yourself I really did know what would suit me. However it didn’t quite fit, but I still snapped it up and took it home! I lost 2 stone, but with the zip back it was still a mission to zip up, but with the help of a lovely seamstress, the zip back was removed and replaced with a lace up panel, (at very little cost) and there it was the my dream dress that truly made me feel like a princess on my wedding day!!! So as promised here are a few pics from the big day! And Patricia I really can’t thank you enough for how you managed to take the stress out of my shopping experience, and for holding the dress of my dresses until I could visit!